Seriously, who knows more about overindulgence in food than Italians? Necessity is the mother of invention. That’s how we have amaro or if you have a couple then it’s amari (plural). Italians gave us this bittersweet, herbal liqueur. It actually means “bitter” in Italian. It’s usually consumed as an after-dinner digestif in Europe. Amari are typically chock full of ingredients. It’s not uncommon to see herbs and roots such as angelica, anise, artichoke, bay laurel, cardamom, chamomile, cinchona tree bark, cinnamon, citrus peel, elder, fennel, gentian root, ginger, juniper, lemon balm, lemon verbena, licorice, menthol, quasi wood, rue, saffron, sage, thyme, wormwood and zedoary. Complex doesn’t even begin to describe it. Sure, the Europeans like to serve it neat, on the rocks or with tonic, but it’s one of my favorite liqueurs to mix in a cocktail. However, to make a proper cocktail utilizing amaro, you’ll need to know which one to use. Each has a unique recipe from the region where they originated, so naturally each will have distinct aspects to leverage. With that said, lets review a few I’ve found myself using. Amaro is an acquired taste. Like with scotch, you don’t just jump into a peaty Islay. Fortunately, there’s the light Amaro Nonino. It’s slightly more mild than the others. Amaro Nonino is made by the Nonino company in Fruili, Italy. You’ll notice right off the bat that it’s a lighter amber than the others. Take that into account when you’re deciding on the color palette of your cocktail. The base ingredient here is an original grappa made by the Nonino company. It’s a blend of Ribolla, Traminer and Verduzzo grapes. The grappa is mixed with grain alcohol and infused with caramelized sugar, cinchona, quasi wood, rhubarb, saffron, orange peel, tamarind, galenga, gentian and licorice. Be careful when sniffing this amaro as its base is grappa, so your gonna get some burn in the nostrils. Once past that, you’ll notice a sweet aroma with tamarind, rhubarb and woody quassia chips. Upon first sip the entry will be sweet and smooth as throughout the entire tasting experience. Upfront sweet flavors with caramel, and tamarind. Mid palette hits with mild bitter wood flavors and also the grape from the grappa. Finish is smooth, elegant, tame and of course slightly bitter with a clean licorice wrap up. A great starter amaro and goes great with gin. Fratelli Averna dates back to 1868, but the recipe for Averna Amaro dates back centuries before that with the Benedictine Friars in the San Spirito Abbey in Caltanissetta Sicily using it as an herbal tonic. The aroma is very prominent, but what is that smell… Maybe menthol or peppermint. There are spicy upfront notes consisting of green pepper mixed with cayenne pepper. The mid palette consists of blood orange and lemon peel. It finishes up with a caramel sweetness and a menthol freshness. The bitterness pushes through to the finish with a lingering tree bark, possibly chincona bark. Amaro Montenegro was first produced in 1885 in Bologna, Italy by Stanislao Cobianchi. The name of this amaro intended to pay homage to the second queen of Italy, Princess Helen of Montenegro, on occasion of her marriage to Victor Emmanuel III. Amaro Montenegro has an upfront scent of orange peel, fresh coriander, vanilla, red cherry, pekoe tea and cucumber. The palate entry is sweet at first, but quickly turns bitter and botanical. However, I feel the outstanding character of this amaro is the sweetness of tangerine. If you need to express citrus notes in your cocktail this is the amaro to chose. Also, it has an interesting bottle that would look great on your bar. In 1815 Ramazzoti was created by Ausano Ramazzotti in Milan, Italy. The ingredients are a secret, but the manufacturer says that there are 33 ingredients, including gentian, cinchona tree bark, rhubarb, cinnamon, oregano, sweet oranges from Sicily and bitter orange from Curaçao. It has a reddish brown color, which should be accounted for when establishing a color palette for your cocktail. Ramazzoti has some real deep flavors. The chinchona bark stands out first for me. It’s hard to identify all the flavors mentioned above though. The cinnamon stands out in the mid palette with some jammy rhubarb. All in all this is a deep and dark amaro that makes me think of root beer-tamarind. It’s bitter upfront and in the finish. Most Outstanding Characteristic: Flavor of Artichoke. Cynar is made by the Campari Group and is a mix of 13 different plants and herbs. However, the most unique ingredient is definitely that of artichoke. This is what catagorizes it as a Carciofo style amaro. It is noticeably a darker hue of brown too. Cynar and orange juice is very popular in Switzerland, so it’s proven to go well with citrus components. Cynar is low in alcohol content too. This can lend itself nicely to a cocktail recipe. Fernet Branca is aptly named as it is a fernet style amaro. Fernet amari are a more sharply bitter type of amaro. Fernet Branca contains 27 different herbs and spices taken from four continents. Among the known ingredients are aloe, gentian root, rhubarb, gum myrrh, red cinchona bark, galanga, zedoary and saffron. Their secret recipe hasn’t changed since its creation in 1845. Fernet Branca has a cult-like following in Argentina, where they mix it with cola. It’s also catching on in San Francisco (35% of US consumption). There they like to drink it neat with a ginger ale or a ginger beer back (my favorite way to enjoy it). The whiff test reveals peppermint and caramel, almost like a lightly burnt candy cane or peppermint candy. It’s possible I’m also detecting the pine and soap tones from the galanga. The first thing that comes to mind when tasting Fernet Branca is that Binaca spray I used to use back in middle school. It’s a punch in the mouth that everybody should take at least once. This is definitely the most extreme and bold amari. There’s a lot of menthol, very minty, very mouth numbing. Amaro CioCiaro was created by the Paolucci family in 1873. It’s named after the region of Italy in which it’s made. Amaro CioCiaro is a bit on the sweeter side, but still carries a mild bitterness. It’s easily drinkable by itself. It has upfront flavors of anise and licorice. The mid palette is slightly bitter, but followed by sweetness and dark flavors of chocolate and coffee. It’s a very nice amaro for the price and I could see it going well with a real Coke and it won’t take over in a cocktail. The Inga family’s spirits and liqueurs have an uninterrupted saga that began in Noto, Sicily in 1832. The family has won many awards over the years, so expect nothing less than excellence from their amaro. My Amaro has a mello aroma. It’s definitely a sweeter amaro. It has a very elegant mouth feel. I’m guessing it’s barrel aged. It’s a smooth amaro that is a great sipper. It’s a well balanced amaro with an upfront hint of menthol. Floral notes dominate the mid palette, maybe lavendar/chamomile. Still it’s deep with tree bark and carmel tamarind. It’s a little spicy and has hints of citrus. My Amaro is a well balanced amaro that’s bursting with flavors that blend together well. Amari are very complex. I wouldn’t be surprised if I missed something. Please, if you have any tasting notes to share, I’d love to hear them. Actually amari (particularly fernet) are my favorite liquors. It’s true! And one of the best usage of amari (certainly Ramazzotti) is the Black Manhattan Cocktail (or Fernet Cocktail with rye in a case of fernet). Do you mix something like that? Hi ! I have a question regarding Fernet Branca Mint, and wonder if you have ever tried it ? There is also a Ramazzotti Mint. Which one do you think I should try first ? I have regular Ramazzoti and Frenet and I would say I prefer the Ramazzoti straight up with ice. Paul, I have yet to try Ramazzotti Mint, so I couldn’t tell you. Let me know your tasting thoughts. I should do an update on this post with many more Amari. I love this stuff. Hi Josh ! I’ve aquired a bottle of Amaro Lucano, and evidently it’s mostly being drunk straight with ice and optional soda water. 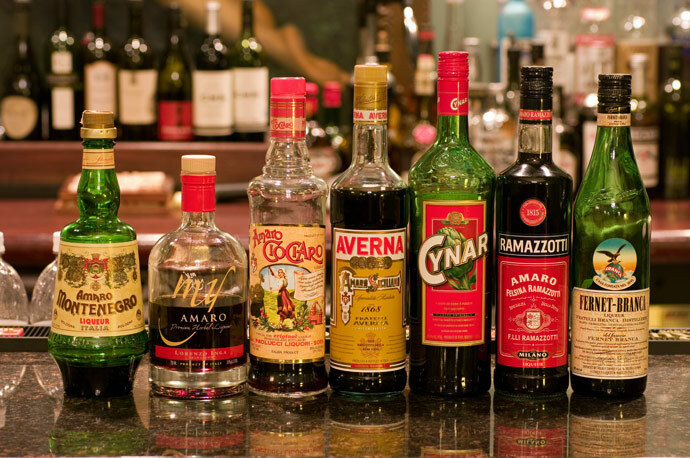 Do you know any cocktails which call for Amaro Lucano, or could you try it in different ones and substitute other Amaros for Lucano ? I am also trying to find a bottle of Byrrh, is it something you have tried ? Is Cocchi Americano a better version of Lillet Blanc ? I have read somewhere that the Lillet recipe was changed around 1980’s and that there is less quenine in it now. How should I store the Cocchi Americano. Is it ok to keep it at room temperature or should it be refrigerated ? Lots of questions, I hope you can help. Thanks ! Paul, I’m a huge fan of Amari. Unfortunately here in Maryland our distributors are a little behind. I have never tried Lucano or Byrrh and doesn’t look I can get my hands on them in MD. Cocchi Americano is very similar to Lillet Blanc and you could substitute it. I would vacuum pump the Cocchi Americano and store it in the fridge. Allow me to point you toward a website: “Drink Up NY.” They are based in Brooklyn and have a storefront there. They ship to MD/VA/DC and I order from them as often as I can. It is dangerous to browse, because they seem to get their hands on just about everything before anyplace else in the US, so they invariably have what I want. Got my Byrrh from them. outstanding blog. I had Averna and it tastes of mild root beer though not as sweet. Also I had Ramazzotti amaro and it has the flavor of a very mild cola it’s delicious in a sugary cherry coke.